RPS6 antibody recognizes the 40S ribosomal protein S6, also known as phosphoprotein NP33. This antibody has been extensively validated for western blotting using whole cell lysates. Mouse anti Human RPS6 antibody recognizes the 40S ribosomal protein S6, also known as 40S ribosomal protein S6, phosphoprotein NP33. Ribosomes, the organelles that catalyze protein synthesis, consist of a small 40S subunit and a large 60S subunit. Together these subunits are composed of 4 RNA species and approximately 80 structurally distinct proteins. Encoded by the RPS6 gene, 40S ribosomal protein S6 is a cytoplasmic ribosomal protein that is a component of the 40S subunit. The protein belongs to the S6E family of ribosomal proteins. It is the major substrate of protein kinases in the ribosome, with subsets of five C-terminal serine residues phosphorylated by different protein kinases. Phosphorylation is induced by a wide range of stimuli, including growth factors, tumor-promoting agents, and mitogens. Dephosphorylation occurs at growth arrest. The protein may contribute to the control of cell growth and proliferation through the selective translation of particular classes of mRNA. As is typical for genes encoding ribosomal proteins, there are multiple processed pseudogenes of RPS6 dispersed through the genome (provided by RefSeq, Jul 2008). 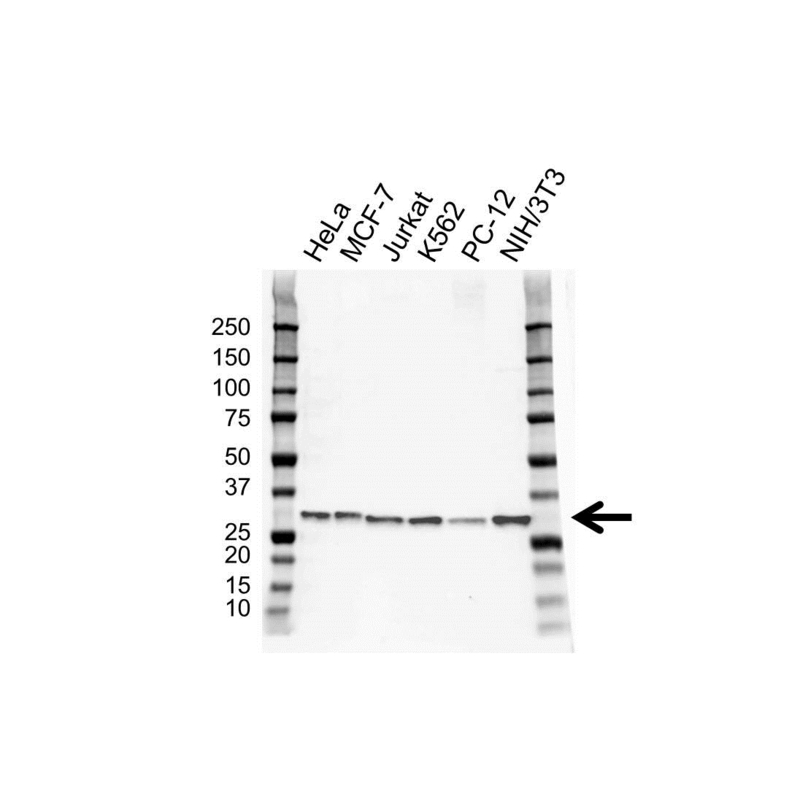 Mouse anti Human RPS6 antibody detects a band of 32 kDa. The antibody has been extensively validated for western blotting using whole cell lysates.